Starring: Daniel Day-Lewis, Sally Field, David Strathairn, James Spader, et al. Lincoln opens to a battle sequence: North vs. South, Blue vs. Grey, Black vs. White, and proverbially Brother vs. Brother. As the battle wages, the remaining Union states are divided nearly as sharply. During the winter of 1865, Abraham Lincoln sets out to pass a proposed 13th Amendment to the Constitution, one which will abolish slavery for good. Lincoln's previous Emancipation Proclamation was a wartime measure, and he fears it may not hold up in court once the war ends. In the House of Representatives, the Democrats (here a minority party) are outright opposed to the legislation for they see Lincoln as a tyrant, and in the Republican wing, some conservatives want an end to the war post haste, regardless of the "slavery question." Further complicating the mix, there are the Radical Republicans who feel that the proposed Amendment doesn't go far enough, and they wish to grant full enfranchisement to Black Americans. Lincoln must get support from all the Republicans and some Democrats if the bill is to pass, and he must pass the Amendment before the war ends for he will never get the support to do so if the South rejoins the Union. Lincoln is a "men sitting in rooms" film. 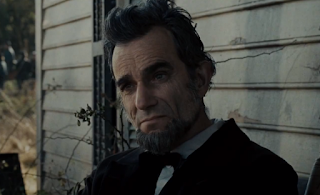 Much of the film is spent with Lincoln and others sitting around, talking about and strategizing on how to pass the 13th Amendment before the end the Civil War. The film is a veritable who's who of mainstream film actors, all of which playing various historical actors with a specific agenda Lincoln must overcome. Presumably every middle school student in the U.S. knows how the story turns out (if not specifics), but the filmmakers do a fine job dramatizing the events and keeping them interesting to the viewers. Particularly of note is the filmmakers decision to not to lionize Lincoln as a saint, but depict him as a shrewd, conflicted president who isn't above hiring some questionable lobbyists to get the Amendment passed. The film also (and wisely) highlights the wit of its historical players in what might have been a very, very dry film. Lincoln does on occasion toy with schmaltz and its comedy occasionally borders on being "wacky." Neither of which are greatly detrimental to the film, but worth noting nonetheless. I'm too old for this crap. 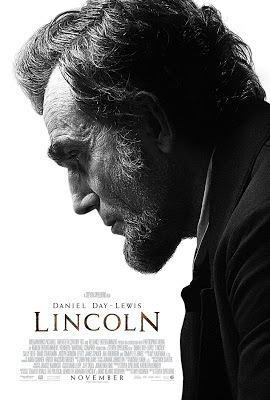 Steven Spielberg directs Lincoln based on a screenplay by Tony Kushner. The duo had previously worked together on Munich. The film uses heavy shadows and seemingly "naturalistic" lighting, emulating an approximation of what the time period might have looked like to its inhabitants. Lincoln is based on the book Team of Rivals by Doris Kearns Goodwin. Lincoln (the man) rhetorically questions in Lincoln (the movie) whether or not if people choose to be born in a specific era. That question may not have a definitive answer, but Lincoln (the movie) couldn't be timelier. As of this writing, Congress is sharply divided and the country has just finished an election which resulted in talk of secession making national headlines. Perhaps the real moral of Lincoln isn't that President #16 magically healed the divisions in the country, but that in times of upheaval, it is still possible for good men to do the right thing.